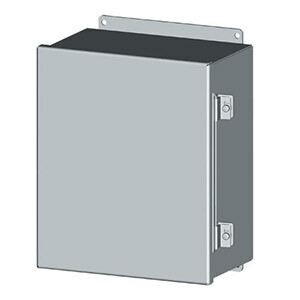 The SCE-CH Series electrical enclosures are designed for use as electrical junction boxes, terminal wiring boxes, instrument housings, and electrical control enclosures. These electrical cabinets provide protection from dust, dirt, oil and water. Swing Out Panel Kits for NEMA Type 12 Electrical Enclosures - allows installation of sub-panels in front of enclosure with swing out access.